The morning after cheetah park, Kelsi and I woke up early to watch the sun rise. We walked the short path to this rickety wooden viewing tower and climbed to the top. The sunrise was gorgeous, and we entertained ourselves by playing the lion king soundtrack as the sun rose. We are nerds. Then it was off to breakfast and into the truck. Our drive to spitzkoppe was only a few hours, so we had time to stop at some craft stalls along the way. We pulled over at the side of the highway to see the wares of the local tribes. They sold bracelets and dolls and all sorts if little hand made trinkets for tourists to buy. 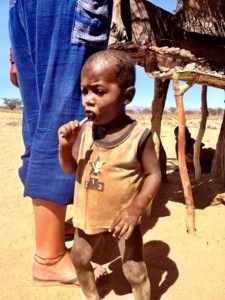 There were three women from two different tribes and three small children running around at their feet. The two tribes were the Hereros and the Himbas and although they both spoke the same language, their customs were extremely different. The Hereros wear long dresses, and have hats with horns on their heads. We had seen them on the border of Botswana and Namibia all grouped together with horned hats and crafts to sell. The Himbas attire is completely opposite. They wear pretty much nothing at all, and the women never shower… Ever. Instead, they cake their bodies in mud to stop the smell and keep their naked skin cool from the sun. They are definitely a sight! 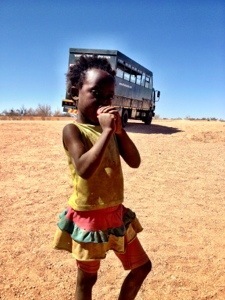 The children were adorable and were having a great time just running around causing trouble. Kelsi and I gave them some lollipops and they were so eager to have them that they started sucking them with the wrappers on. 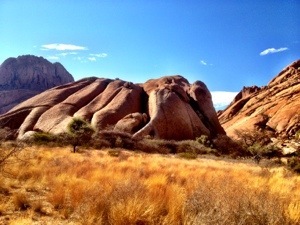 After all the shopping was done we climbed back into the truck and made it to Spitzkoppe. 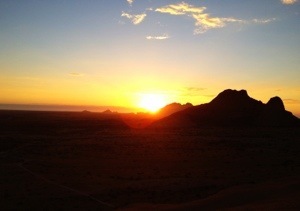 Spitzkoppe is the beginning of the Namibian desert: for us anyways. 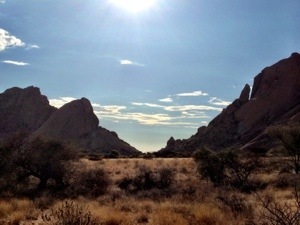 It is deathly hot, very dry, and has some of the most amazing rock formations. Our campsite was right next to this huge, mountain-like boulder. Just down the road, there were more crazy rocks, each one more alluring to climb on than the next. This was Kelsi’s rock heaven. She couldn’t wait to start climbing around! We started with a rock formation called the bridge. The bridge was massive brown-red rocks that stretched out like a walkway across the horizon. Gina, Anisha, Kelsi and I spent a good half hour or so climbing around the rocks, before Kelsi got attacked by wasps and we decided it was best to go home. Seemed like a pretty huge gap. A lot can happen in 3800 years; but there you go! When the walk was over, and we’d had dinner, we decided to hike the 20 minutes to the top of the large boulder for sunset. It was a pretty steep climb at parts, and we left pretty late, but we managed to make it for one if the most sensational sunsets on the trip thus far! Plus, we successfully watched a full sunrise as sunset on the same day! By the time we made it back to the bottom, it was pitch black. We sat around the fire for a little while telling stories, then it was time for sleep. Tonight, however, we were upgrading from our tents, to a cave! 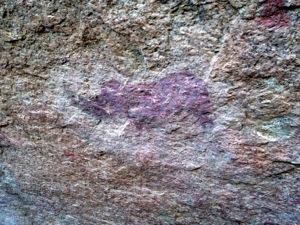 In the giant boulder we were camped at was a little cave that had an opening to see the stars at night. It was a perfect place to sleep for the night! No matter that we saw a rat scurrying about earlier in the day, and our guide ensured us that the scorpions don’t go into caves, and the leopards will avoid us as well. Great. But Manda had set up some candles to light our way, and about 7 of us decided to sleep in the cave and watch the stars! Such a perfect ending to a fun filled day. 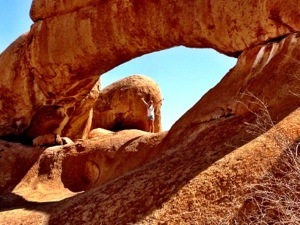 This entry was posted in Africa, Namibia and tagged Bushman's paradise, rocks, Spitzkoppe, Travel by hilarylust. Bookmark the permalink.